GrimmSpeed Power Package - Stage 3 SUBARU - Dezod Motorsports Inc - Home of the automotive performance enthusiast since 2002. The GrimmSpeed Stage 3 Power Package takes the ideology of increasing turbo efficiency to the final level. All the components of this package work together to decrease restriction both before and after the turbocharger, as well as to provide the ultimate choice in boost control. The result is a system that increases both compressor and turbine efficiency, but also works together to control boost. 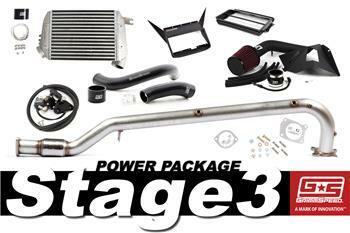 This package further increases horsepower, torque, and engine safety by decreasing charge air temperatures through a vastly superior intercooler design. This is the definitive choice for more boost, faster spool, safety and consistency, and power production.